How do I do this on Windows? This is the new best way to upgrade npm on Windows. Note: Do not run npm i -g npm. Instead use npm-windows-upgrade to update npm going forward. Also if you run the NodeJS installer, it will replace the node version. Upgrades npm in-place, where node installed it. Easy updating, update to the latest by running npm-windows-upgrade -p -v latest. Does not modify the default path. Does not change the default global package location. Allows easy upgrades and downgrades. Officially recommended by the NPM team. Download and run the latest MSI. The MSI will update your installed node and npm. Like some people, I needed to combine multiple answers, and I also needed to set a proxy. E.g. if Node.js is NOT living in "Program Files (x86)" perhaps with where.exe, it is living in 'C:\Program Files\nodejs\node.exe'. Now perhaps it tries to upgrade but you get another error, "node.exe is being used by another process." 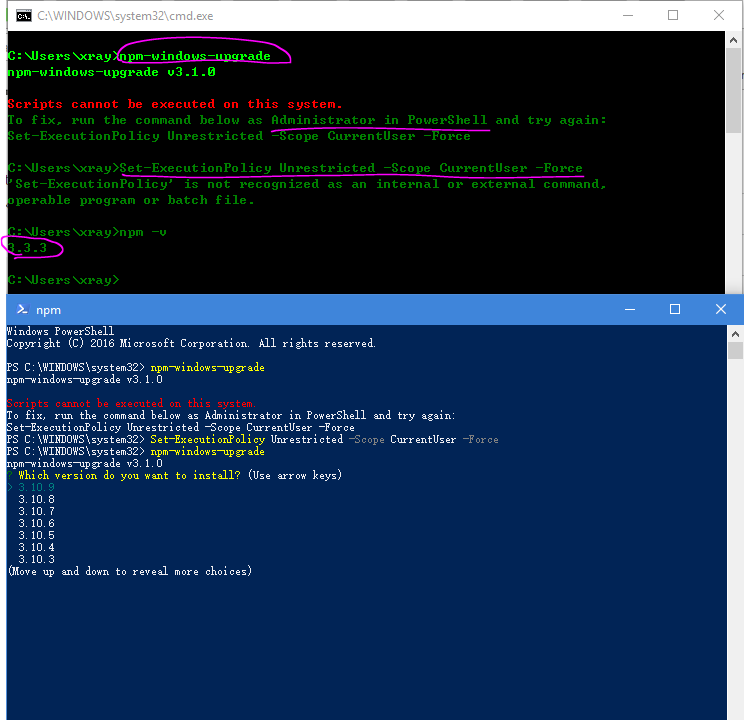 Close /shutdown other consoles .. command prompts and PowerShell windows, etc. Even if you're using npm in a command prompt, close it. DONE. I'm at the version that I want. You can use Chocolatey which is a package manager for windows (like apt-get for Debian Linux). The previous answers will work installing a new version of Node.js (probably the best option), but if you have a dependency on a specific Node.js version then the following will work: "npm install npm -g". Verify by running npm -v before and after the command. You should now have the latest node and npm. I went a little further and decided to implement a nvm for Windows. This is the official document for a user to upgrade npm on Windows! Uninstall Node.js. Click the Start menu, type "Change or Remove a Program", click on the item shown, find Node.js in the list and uninstall it. Delete directories, both C:\Program Files (x86)\nodejs\ and C:\Program Files\nodejs\ if they exist. The uninstall/delete/install seems unnecessary, but it often is and this will save your time. These instructions come from Microsoft. This is the official documentation for upgrading npm on windows. All was tested and working on Windows 10 (2017). Uninstall Node.js in control panel Add/remove programs. For me, after totally uninstalling node. 10.29, and then installing node 4.2.2, there remained a 10.29 node.exe file in my c:\windows folder. So even though I had successfully installed version 4.2.2 via the msi executable, the command "node -v" would continue to return 10.29. Node Version Manager (nvm) for Windows but for Windows, with an installer. Download Now! This has always been a node version manager, not an io.js manager, so there is no back-support for io.js. However, node 4+ is supported. I followed @josh3737 and installed the latest MSI from the node.js homepage. The new installation added the new directory into my path variable after the old one. So the old installation was still the active one in the path. After removing C:\Program Files\nodejs\ from system path and C:\Users\...\AppData\Roaming\npm from user path and restarting the command line the new installation was active. Maybe the least path was a local problem that has nothing to do with the new installation, I had two links to AppData\Roaming\npm in it. And maybe this can also be fixed by first uninstalling node.js and installing the new version afterwards. This will show list of versions available to install. Just select your desired version by moving up/down key & Press Enter. and npm updated successfully. Earlier I was trying for CMD and that was throwing error. may be some path issue that got resolved by running NodeJs Command Prompt. hope it'll work for you. try this. To install the updates, just download the installer from the Nodejs.org site and run it again. The new version of Node.js and NPM will replace the older versions. OK guys, I read (tried on Windows) all the previous stuff and all of these answers have their own disadvantages. For the best way to update Node.js (at least for me), go to https://nodejs.org/en/ Then download the last version and install it in same folder you installed the previous version in - 1 min and it's done. You don't need to remove any old files. Remove environment path C:\Program Files\nodejs from envrionment variable PATH. Now you will have your new version which you installed. Note: If you don't remove path. You will see the previous version of node. You wanted to install npm 6.1.0, but the installed version is 3.10.10. A common reason is an attempted "npm install npm" or "npm upgrade npm". As of today, the only solution is to completely uninstall and then reinstall Node.js. For a small tutorial, please see http://aka.ms/fix-npm-upgrade. Please consider reporting your trouble to http://aka.ms/npm-issues. If you are upgrading from a previous version of node, then you will want to update all existing global packages. You can also specify the package name to be updated. This might help someone. Neither "npm-windows-upgrade" nor the installer alone did it for me. Powershell was still using an older version of node and npm. So this is what I did (worked for me): 1. Download the latest installer from nodejs.org. Install node. It will update your node; everywhere (Powershell, cmd etc.). 2. Install the npm-windows-upgrade package (npm install -g npm-windows-upgrade) and run npm-windows-upgrade. I didn't uninstall anything and didn't set any paths. In my case, I discovered that I had two copies of Node.js installed. One under "C:\Program Files\nodejs" and another under "C:\Program Files (x86)\nodejs". This is what worked for me. Open a local folder other than the one in which nodejs is installed. Delete the npm folder and replace it with the npm and bin folders in the local folder. Run npm -v. Now you would get updated version for npm. Note: I tried installing npm directly in "C:\Program Files\nodejs\node_modules" but it created errors. Not the answer you're looking for? Browse other questions tagged windows node.js npm package-managers or ask your own question. How to uninstall npm modules in node js?